i have an extreme love for soups of all kinds. in my mind, soup is the perfect food. it’s a pick-me-up when you’re feeling under the weather, it warms you on chilly, gloomy days, + it takes you back to your childhood – the definition of comfort food. one of my earliest soup memories is as a first grader – i was a picky eater, so my mom would get up early to make me soup + pack it in a thermos for my lunch. 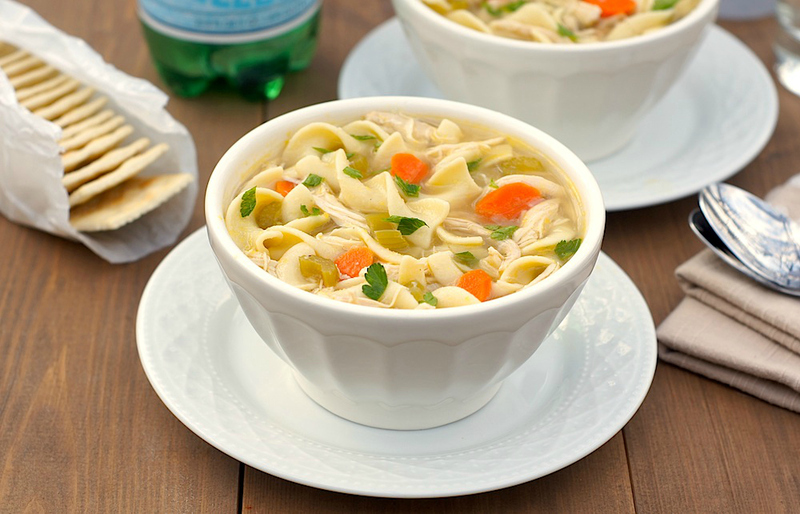 while all the other kids were eating ham + cheese sandwiches, i was enjoying warm chicken noodle soup – YUM! and thus my love for soup was born. now that i’m grown-up, i no longer need my mom to pack me a thermos full o’ hot soup for lunch (although i’m sure she would if i asked!). these days, i make a slightly more grown-up version for myself, full of fresh white-meat chicken, lots of veggies + egg noodles, with a rich, savory broth that is simply heavenly. my favorite part about this soup is the slight hint of lemon in the broth – it adds a delightful flavor that takes this soup from great to wonderful. so, if you’re looking for a simple yet absolutely delicious soup, look no further – this one will definitely be a crowd-pleaser! place a soup pot over medium heat + coat with the oil. add the onion, garlic, carrots, celery, thyme + bay leaf. cook + stir for about 6 minutes, until the vegetables are softened but not browned. pour in the chicken stock + bring to a boil. add the noodles + simmer for 5 minutes until tender. fold in the chicken, + continue to simmer for another couple of minutes to heat through, + until noodles are cooked to al dente. add the lemon juice, + season with salt + pepper to taste. sprinkle with chopped parsley (if using) before serving. This soup sounds just like a perfect bowl of comfort. lovely! I totally miss my dad packing my lunches for me in the morning. And I have a serious weak spot for the canned chicken and stars soup, especially when I am sick. Those stars just make everything seem okay! Haha, but I definitely think this soup would work magic too. Mmm…this looks like chicken soup I love. It so reminds me of times I was down with a cold and my mom would make chicken noodle soup because I couldnt eat anything else. I grew up on chicken noodle soup from a can. It wasn’t until my adulthood that I discovered how simple and delicious fresh homemade chicken noodle soup is! My kids will always have homemade for sure. Now if I could only learn to make Top Ramen. You can’t beat a good chicken noodle soup. We add avocado and a squeeze of lime to ours. There’s nothing better. There really isn’t. Oh I love a good Chicken Noodle Soup! I took a lot of soup to school also. It’s just so good and warm! This looks like a wonderful recipe as always Amy! Thanks For Sharing! definitely saving this so we can nourish our bellies with some delicious soup next time The Crud comes round! Beautiful soup Amy. I know any soup from you would be wonderful because of how much you love to eat it. you are so sweet, renee – thank you! and you’re right – i do think i love soup more than anyone else i know. I could seriously eat it every single day! Thank you for posting this! Alex loves chicken noodle soup but I’ve never found a recipe that really looks right. This looks perfect! I don’t like soup but this is still gonna get made. And oh those saltines! I love those. Whenever I was sick, it was my excuse to eat a whole box of ’em. Now I get rice cakes. Booo. hope Alex loves this! And yay for another saltine-lover. i only buy them when i’m feeling sick, but then i totally want to devour the whole box even when I feel better. those salty little crackers are addictive! lovely photos, amy! i was the kid who didn’t like soup so i can’t relate, but as an adult i have grown to adore it. What a delicious looking soup–thanks to such great photos! I never think to add lemon juice to chicken noodle soup–I bet it’s the missing thing in mine. There is something so warming about this soup! i love how light and bright the soup looks with the splash of orange from carrots and green from parsley…looks so comforting and warm and picture perfect! I love the use of wide egg noodles! Hee, my mom also used to send me to school with a thermos of soup – seriously awesome! This soup turned out gorgeous, Amy! I LOVE soup, especially this time of year, when I’m freezing all of the time! This soup looks so comforting and hearty! Perfect for cold winter nights! I’m eating a bowl of soup as I type this, and I couldn’t agree with you more: soup is the perfect food! I loveeeee the look of this home style chicken noodle. I used to HATE chicken noodle soup, but have been converted. Its one of those soups that just makes you warm and happy. I love that you added lemon and saltines. No chicken soup is complete without saltines. Can you tell me what ‘shelf’ broth brand you use? I never know what to pick. Thank you.. This soup is what I need tonight. Hi Jan! I like Pacific all-natural free range chicken broth and Imagine Orangic free-range chicken broth – both of those are available in the organic section of my local Kroger. In a pinch I’ve used Kitchen Basics chicken broth, but i like the other two better. Hope that helps! Now that I’m a mom, my kids rely on ME for the comfort of chicken noodle soup. ME! I can’t believe that it’s now my turn to ladle hot bowls of this soup for them when they are sick or feeling cold or under the weather. Guess it’s sort of like a “pay it forward” kind of karma. My mom made this for me, now it’s my turn…This one’s a classic! 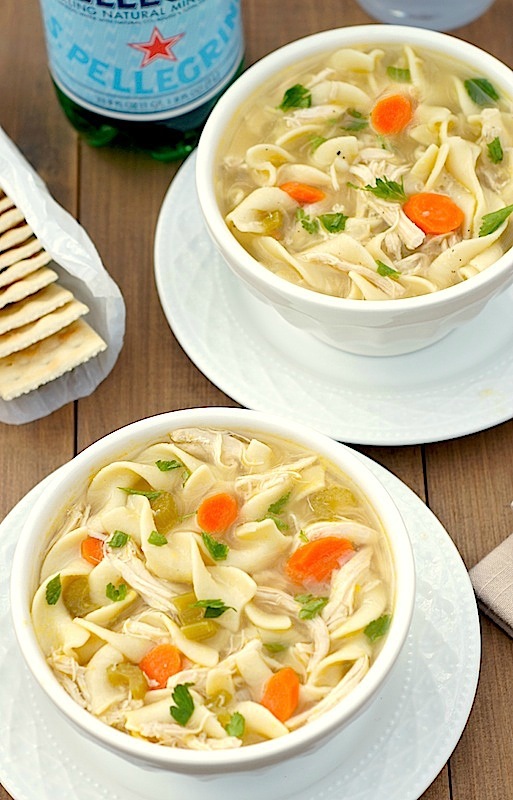 I love homemade chicken noodle soup, but I’ve never made it! This looks really good! I haven’t made chicken noodle soup in years! Your looks hearty and so comforting for this cold weather! I love homemade chicken noodle soup! I make chicken broth all the time from leftover chickens. I wish I could master egg noodles from scratch…maybe one of these days. Your soup looks delicious! the super chilly weather, gray days, and boring office job always make me crave homestyle soup like this in the winter. you cannot beat chicken noodle soup and with the little sniffles i’ve been having lately, this is the perfect cure. My son and I are just now getting over the flu, and my husband’s about to start his next round of chemo. I don’t suppose you’d deliver a 5-gallon bucket of this, even if I said pretty please??? For you, I would *absolutely* deliver! Hope you + your son are feeling better soon, + that your husband’s chemo is wonderfully successful (and not too hard on him). Hugs!